For market leading explosives provider Orica, technical innovations in the mining sector are presenting an incredible array of opportunities and growth. Angus Melbourne, chief commercial and technology officer at Orica, recently outlined to Austmine some of the cutting-edge technology and collaborations that keep the brand at the forefront. Orica, the world’s largest provider of commercial explosives and innovative blasting systems to the mining, quarrying, oil and gas and construction markets, is at the forefront of the technical revolution in mining. 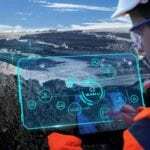 By utilising new technology, Orica foresees a future where digital and automated technologies create safer and more productive blast outcomes for customers, all while unlocking value for mine operators. Headquartered in Melbourne, Australia, Orica has amassed more than 140 years of experience, with a diverse workforce of 11,500 employees servicing customers in over 100 countries. Times are changing in the mining sector, with robotics, automation, big data and the Internet-of-Things, transforming every element of the value chain, from exploration, mining and processing to transport. These technological breakthroughs are delivering significant advances in safety, productivity and environmental outcomes. According to Angus Melbourne, Orica Group executive & chief commercial officer, the scope for automated, data-driven optimisation in the drill and blast segment of the mining value chain is significant. Melbourne says, “We have a unique role to play in addressing these specific needs and the broader transformation of the industry. “The products and solutions we are enhancing, developing and launching today are all part of this transformation – underpinned by a single platform that will bring drilling and blasting into the 21st century, meeting the discrete needs of an ever-changing industry. “Data enabled blast optimisation will finally allow an industry scalable alternative to blasting for drill and blast unit cost control. 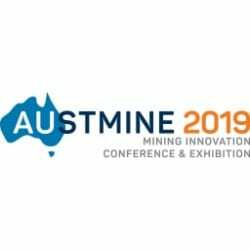 At Austmine 2019, Melbourne will present an outline of the future moves of Orica, with a focus on three core pillars; digitally enabled better blasting, blast automation, and the evolution and optimisation of Orica’s product portfolio. These pillars are aimed at addressing customer’s requirements, while based on the long-term trends forecast for the industry. Melbourne says, “One key area of investment is in our digital blast optimisation platform, BlastIQ and ever-growing digital capabilities, which are designed to improve blasting outcomes, by integrating insights from digitally connected technologies at every stage of the drill and blast process to drive continuous improvement for our customers. The mining industry is looking to drive greater productivity and safety through the implementation of automated technology, even though to date, drilling and blasting elements have largely remained a manual task. “We believe that our world-first wireless blasting system is a game changer for the industry, just like the introduction of ammonium nitrate was in the 1950s and 1960s,” says Melbourne. Importantly, wireless blasting technology also delivers a critical first step towards full automation of the drill and blast process, across both the underground and surface mining sectors. Keeping up with the latest technology is the third pillar for Orica, with the view to incrementally improving its offering. To capture the full potential of rapidly evolving technologies, Orica is constantly on the lookout for new ways of thinking, new ways of working, as well as collaborations across the industry. These partnerships with customers, industry partners, suppliers, and the communities in which the company operate, is seen an important way to implement value added innovation. “Customers are at the heart of why we create and deliver innovative blasting solutions,” Melbourne says. “By understanding our customers’ challenges and sharing their goals and aspirations, we deliver better outcomes for them every day, and use this insight to create new technologies that will deliver increasing value for them in the future. 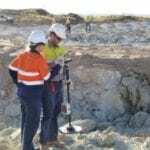 Equally in importance as the relationship with customers, Orica’s association with world leading METS, research, education and technical institutes, results in a broadened scope of research, leading to boundary pushing innovations. Orica also has a total of five dedicated Centres of Innovation and Collaboration around the world, located in Australia, Chile, United States, Canada and Sweden. The centres showcase Orica’s innovations and host Orica’s customers, enabling joint development of ideas, technologies and business concepts, connecting the industry with mining specialists and thought leaders from around the world. “We see these centres as an ideal base to co-create, incubate and accelerate new technologies with start-ups, partners, customers and industry that directly benefit and deliver against the needs of our industry,” Melbourne says. 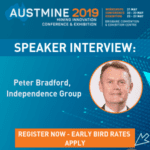 Hear Angus Melbourne share his thoughts when he takes to the stage as a special guest speaker at Austmine 2019.